Baby Blue High Grade 100% Cashmere 2 Ply Shawl. This is one of our highest quality, classic shawls. The material is very fine 100% Cashmere wool, hand woven in Nepal. Cashmere is available in several grades, but with this shawl we offer only the highest quality Cashmere, which is less than 19 microns in diameter. This Shawl is a plain single color, and has been made using the finest Cashmere wool threads, hand woven in Nepal. It is 2 Ply, making it very light weight, but warm and very soft to touch. It is brand new, and will be delivered in a beautiful presentation Gift Box. 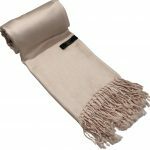 These shawls are 100% genuine cashmere and have been independently tested to ensure their authenticity. This is a perfect luxury fashion accessory, that can be worn all year round to complement any outfit. An absolutely gorgeous shawl!